Wow, is it summer here or what, a great weekend ahead for Mother’s Day and appropriately there is a herd of people in the stores checking out the grilling equipment for their cooking contribution to Mom’s dinner, don’t forget the side dishes… the whole dinner and serve a nice chilled salad or two to fill out the menu. I have a couple of old cookbooks that I pull out and keep handy in the kitchen as I am constantly looking for “something new” from these old books from the late 60’s and 70’s. Mike has a few favorites from each and we have great memories of sitting on the lawn at Wolf Trap sharing a picnic with a tasty bottle of wine, not sure if you can still do this especially bringing in the wine as I am sure things have changed in the park over the past 35 years…always a special time with family and friends. Easy dinner or picnic side dish, just a bit different and a nice change. 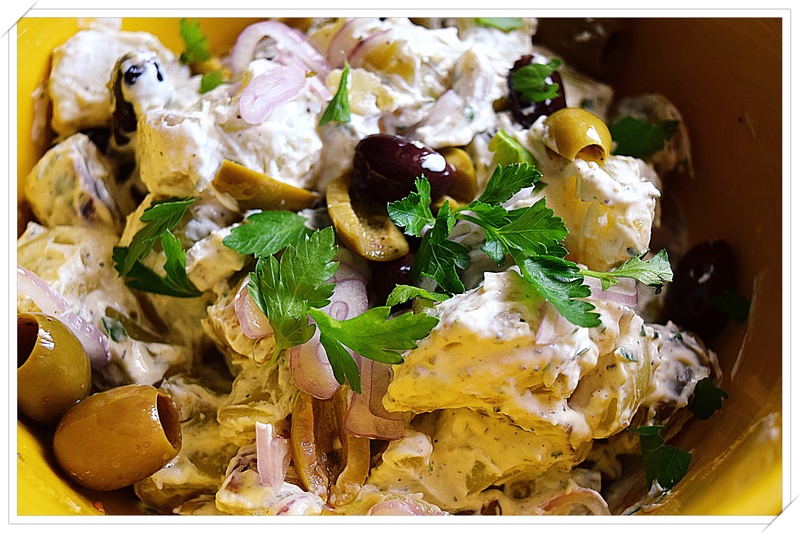 Now one potato salad that Mike loves is a recipe from The New Carry-Out Cuisine, Potato Salad Madagascar a creamy dressed potato salad with green peppercorns and oil-cured olive. Well, I couldn’t find brined green peppercorns locally and I was out of the oil-cured olives, but I did have quite an assortment of other black, green Greek and Italian olives…I have since ordered the green peppercorns from Amazon and replenished my Italian oil-cured olive supply. If you don’t care for olive, well, what can I say to that but you are missing out on a great earthy dish for your next cook-out.